When Dan and I started Autistry Studios we wanted to create a place for our son, a place where he would thrive after we were gone. With the help of our students, their families, our staff and the community, Autistry is becoming more than we could ever have imagined. 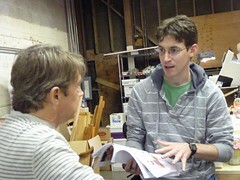 At Autistry we love to build things – models, swords, movies, books, armor, dragons…just about anything! But underneath the projects what we are building is community. We are learning how to help each other reach our goals and how to ask for help when our own goals seem out of reach. We hold the other end of a board while our classmate saws. We wrap a friend in plastic to help him make a mold for his armor. We give encouragement, praise and critical feedback. And we laugh together, eat together and play together. 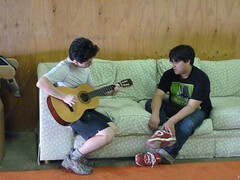 Autistry Studios is becoming more than a program for learning skills. It is becoming a community of individuals who understand and accept each other. Last week a young boy told us he likes Autistry because here he gets “real help from real people.” We are proud of our staff members. Each one is kind, educated, experienced and quirky! Autistry attracts people with wild ideas and boundless energy – both staff and students. Though we are very different there is a like-mindedness that holds us together. Our vision is to see this community grow wider and deeper – more members, more programs, more opportunities for growth. 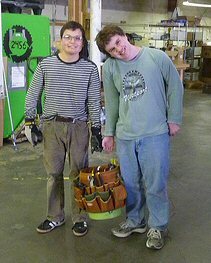 We want to insure that our students not only acquire vocational skills but create personal bonds that will span a lifetime. Those bonds will be their safety net, giving them strength and support as they grow older. We’re doing it again! 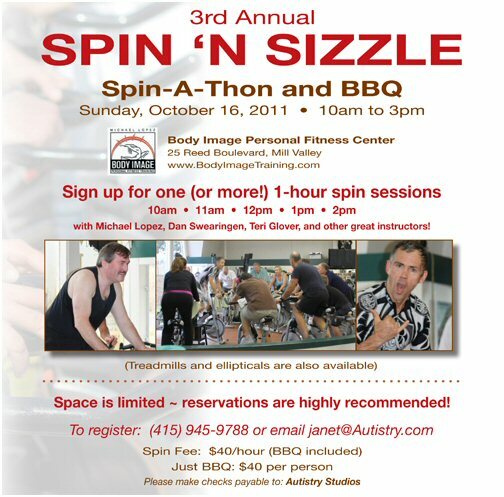 The 3rd annual Spin ‘N Sizzle happens on Sunday, October 16th from 10am to 3pm. Great exercise. Great food. Great people. Hosted by Michael and Christine Lopez of Body Image Personal Fitness Center.